Good morning swarthy soul pods and happy Valentine’s Day! Please note: This is not the blog post with a list of launch features. That’s to come later this week. We have finished the Gold Build! It has been sent off to Microsoft and Sony for the first leg of the submission process. This is essentially the same as the certification process we had to go through when patching Xbox: Microsoft and Sony will check our submitted build to make sure it follows their set requirements and standards. Stability, branding, GUI consistency and responsiveness (among others) have certain requirements that we need to hit. This is to ensure that the experience is consistent across games. The build might get rejected, but if it does we’ll get a list of everything we need to fix and then we’ll resubmit as quickly as we can. To reduce risks and ensure we find all critical bugs, our external QA partner, Testronic, has switched to double shifts and doubled their number of testers, giving us QA coverage 16 hours per day, 7 days a week. Over in combat land we did another playtest on Friday. The American Funcom office in Durham, North Carolina, got to check out the combat and content revamp, providing us with some great feedback. A lot of issues were reported for GUI and control, especially related to gamepad support. As a direct consequence we’re assembling an internal strike team to remedy as many of these issues as possible for launch. We’re doing another round of playtesting very soon. This time around we’ll be bringing in an external focus group to give the game a spin. It will consist of both experienced and inexperienced Conan Exiles players, so we can see how they respond to the game. After this we’ll do whatever changes we need to do based on their feedback. Once all that’s over with we’ll move the whole thing to Testlive to get critical feedback from the community. We expect this to happen before March. Due to the Gold submission taking time and priority we know we are sliding a bit from our previously stated deadline (mid-February), but we think it will be worth the wait. This will only make the game better. In the version coming to Testlive you’ll be getting all the new combat changes and the content revamp, which changes the placement of NPCs, creatures and resources on the map to improve progression. You will also get the new Perks system. The Jungle/Swamp biome or the Volcano is not included in this build. If you travel to these areas, you’ll only see a flat texture. We’re keeping them back so we can do additional rebalancing and updates before rolling them out for launch. Every Friday, the development team meets up to highlight and talk about what they’ve been working on recently: New content and features, bugs that have been fixed, and things to come down the pipeline. To not make this newsletter overly long we’re only sticking to the highlights. Even if something isn’t explicitly mentioned things are still being worked on “behind the scenes”, and we’ll mention these when they’re relevant. We have a new team, Monster Hunters, made up of a designer and three creature animators. They’re the people in charge of the creature revamp we mentioned last week. Monsters and animals need to be updated to fit in with the new combat system, so we’re giving them new attack animations with a greater focus on telegraphs and anticipation time in order to make creature combat more tactical. PvE is just as important as PvP in Exiles and we want the new combat system to feel good when fighting both creatures and humans. Their work has already started. They’ve been laying the ground work for what needs to be done the coming weeks. Maybe you’ll see some gifs in the next couple of newsletters? The big thing coming out of the Terraformers team this week are changes to how you unlock weapons and armor in the game. Essentially, we’re redoing everything to put the different kinds of armors and weapons on more of an equal footing. In the old system you’d unlock new types of weapons, armor and clothing as you leveled up. You started with very low-end stone weapons and light armor, incrementally moving onto slightly better and better stuff as you leveled up. We’d condition you to think that the final weapon and armor unlocked would usually be the best. This is what all players would use when reaching the level cap. A lot of it had to be unlocked separately too! Unlocking weapons and armors still happens when leveling up, but we’re trying to create a better balance between the different things you unlock. We’ll break it down to armors first, then weapons. When you reach level 10 you can unlock the “Armorer” Feat. 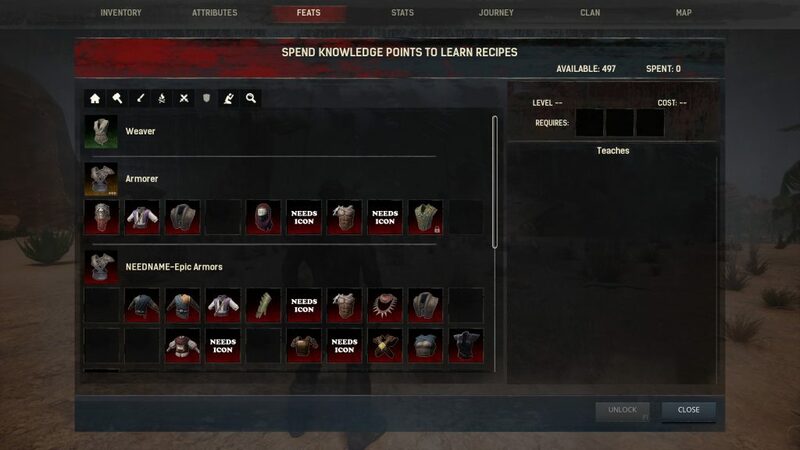 This gives you the recipes for basic Light, Medium and Heavy Armor. The only thing stopping you from making these armors immediately is your access to resources. If you want to just use those three sets you can spend your Feat Points on other things and never look at another armor set again. After unlocking Armorer, you also have the option to unlock additional armor archetypes every 10 levels. They give you access to new sets or armors, from light to heavy. These are based on the different Hyborean cultures and are just as viable as the basic armors. We’re balancing the different armor types by giving you buffs to different things based on which armor you’re wearing. But wait, there’s more! Once you reach level 60 you can unlock Epic Armors. The Epic Armors feat lets you craft Perfected Lining and improved versions of the basic armors. If you have additional Feat Points left you can unlock Epic versions of any culture armors (without needing to unlock the original), to craft a more powerful set. Keep in mind that you won’t be able to unlock all armors, so spend your points wisely. Certain faction and special armors will be locked behind a thrall or a recipe found out in the world. Armorer thralls will also be able to make Exceptional and Flawless versions of their cultural armors. We’re doing similar Feat groupings for weapons and removing a lot of the prerequisites needed to unlock things. Melee weapons are grouped into three basic categories: Warrior, Bruiser and Skirmisher. Warrior unlocks the Stone Sword and Club, and is required if you want to make swords, axes, clubs and maces. The Bruiser Feat is for heavy weapons, unlocking the Stone Maul, Stone Pike and Two-Handed Stone Sword, and further iterations down the line. If you have your eyes on a Steel Hammer you’ll need this first. Skirmisher is the basis for making daggers, javelins and throwing axes, letting you unlock the Stone Daggers and Stone Throwing Axe at first. Once any of these Feats are unlocked you can get the recipe for any weapon in their specific subcategory. You just need to meet the level and Feat requirements. Here’s an example: At level 16 you can unlock the Stygian Khopesh if you have the Warrior, Blacksmith and Journeyman Craftsman Feats. There’s no need to unlock any swords. If you then want to craft an Iron War Axe at level 28 you just unlock the recipe, without needing to have unlocked any axes previously. Then, there are the Legendary Weapons. These can be found in specific chests hidden away around the map. Bosses will drop keys that you then use to unlock the chests. Legendary Weapons are broken when you find them, requiring you to use a Repair Kit. Once it’s been repaired you can use it to your heart’s content. 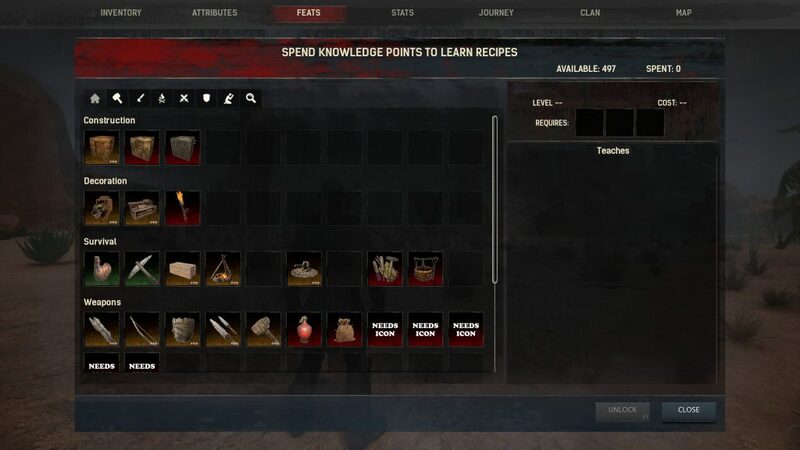 Finally, we’re making it easier to unlock recipes by giving players more Knowledge Points and combining several Feats into one. 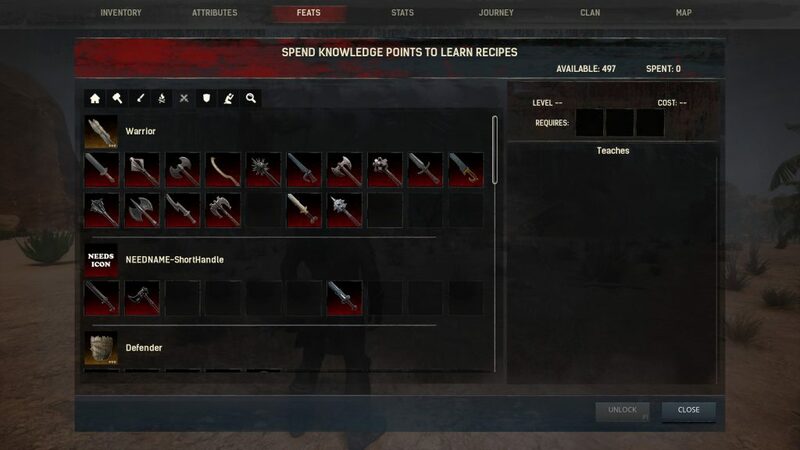 You still won’t be able to unlock everything (unless you cheat), but you should be able to unlock about 50% of all recipes. More combat updates coming in from the Berserkers team! This is also a perfect time to clear up some stuff after last week’s newsletter. As mentioned last week, we’re forcing a third person perspective whenever you climb or equip a weapon in Conan Exiles. This includes bows. You’ll be allowed to harvest, build and craft. The weapon trails you saw in the stream can be turned off, if you choose, but we advise keeping them on just to be safe. It’s our main source of communicating attack information to players. They’re getting a visual pass, meaning we’re re-examining how they look in order to change them. Our art director is working on concepting trail styles that look different for the various status effects. It won’t just be a color change. With these visual changes we can tone down the saturation and presence of the trails without losing the ability to communicate the difference between attacks. We’re also looking at how the camera moves and behaves during combat, both when locking on and aiming freely. This was also something we got feedback on from the community. Speaking of bows, they’ve gotten some changes this past week. The Berserkers team has taken steps to make them feel more responsive when playing. Shots have a higher apex than previously, resulting in a somewhat greater shot distance than before. Arrows are shot in the same direction every time, regardless of distance to target. This is to force players into becoming more skillful with the bow. The intention is for arrows shot while using target lock to hit the torso, not heads or legs. If you want to do headshots or crippling shots you would need to aim manually. We’ve also been working on improving client/server stability to make sure bows fire properly and hit their targets. Another piece of feedback we saw after the combat stream was on the Attributes system. Some players felt that bows weren’t being prioritized to the same level as melee weapons and we want to take a moment to address this. The main focus of the game has always been melee combat. Bows were intended to be included, but we knew that players would need to go in for a melee attack sooner or later. Enemies will usually come directly at you. However, with a decent bow at your side and a high Accuracy stat you can do a significant amount of damage before something reaches melee range. You can pull enemies and kite them from far away, doing decent damage along the way, but you should always carry a melee weapon with you, just in case. Keep in mind that a lot of the changes and updates we’re mentioning in these newsletters still haven’t made their way to the live game just yet. So far, they’re only in our internal builds. We’ve also done changes to things like client/server stability, how we collect crash reports and updated the game code. On top is the Live build, which is what the community is playing. Underneath that is Testlive, where we roll out updates and patches for additional testing before moving them to Live. Then there are the Internal Dev Stable and Unstable branches. The further down you go the newer the code and build. Internal Unstable is what we’re currently developing in and we move builds from Unstable to Stable when content has been locked in. Then we start optimizing and stabilizing that build to then move it to live. This isn’t a 100% correct representation, there are some details we’re living out, but we wanted to give a brief peek behind the curtain to see our process. Lots to take a bite out of in this week’s newsletter, so we hope you enjoyed it. The blog post with all the launch features is still set to come out this week, separate from this newsletter! We’re streaming again on Friday and we will be taking some time out of the stream to talk about our launch features. The main part of the stream is a mod creator highlight, where we’ll be talking to Joshtech, the man behind the very popular Pippi Mod. We hope you’ll join us on Twitch.tv/funcom at 5pm CET on Friday.